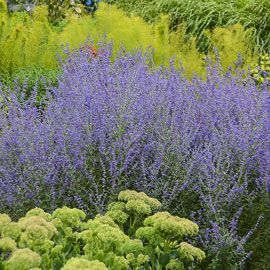 Rocketman Russian Sage | Henry Field's Seed & Nursery Co.
Short, strong silvery stems and clusters of tiny lavender-blue flowers add delightful color and airy texture to any garden landscape—without flopping. This compact variety grows 24- 26-in. 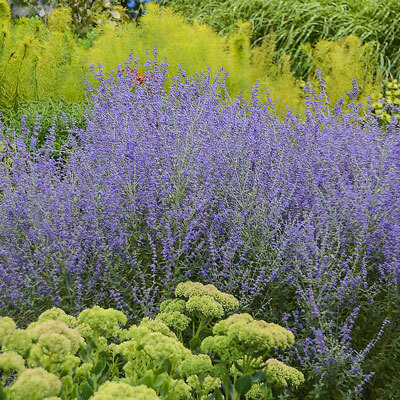 tall with a similar spread and aromatic grey-green foliage that resists rabbits and dear. Blooming midsummer through fall, Rocketman Russian Sage is an excellent drought-tolerant choice that will attract plenty of hummingbirds and butterflies. Bareroot. Zones 4-9. PPAF. Depth: Plant with the crown at soil level. Foliage: Non-dissected, silver green leaves. Blooms: Mid summer through early fall. Soil Requirements: Well-drained soil. Average to dry soil moisture conditions are ideal. Growth Rate: Moderate to fast growth rate depending on warmth. 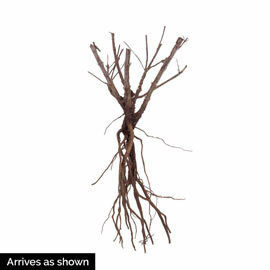 Pruning: Cut back in late Winter or early Spring. Can prune back all the way to the lowest bud.